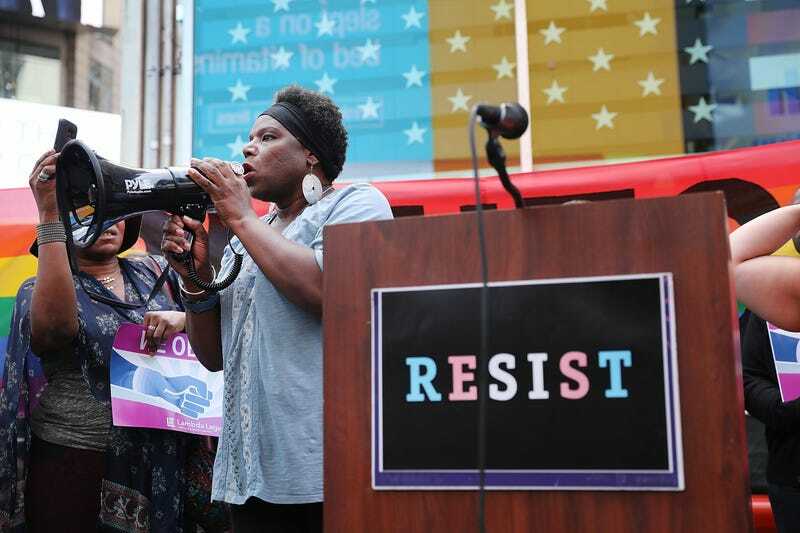 Transgender Army veteran Tanya Walker speaks to protesters in Times Square near a military recruitment center as they show their anger at President Donald Trump’s decision to reinstate a ban on transgender individuals from serving in the military on July 26, 2017 in New York City. Trump citied the ‘tremendous medical costs and disruption’ for his decision. What began as a trickle, by rolling back hard-won changes the Obama administration put into place for transgender Americans, has turned into a full-out assault, as the Trump administration has proposed to legally define gender as a binary biological absolute determined at birth. This proposal has far-reaching consequences if it comes to pass, and will “roll back recognition and protections of transgender people under federal civil rights law,” says the New York Times. Trump (via that feckless lap dog Mike Pence, we’re sure) has steadily been rolling back trans rights since he came into office. The Times reports that several federal agencies have already withdrawn Obama-era policies that recognized gender identity in schools, prisons and homeless shelters. The administration even tried to remove questions about gender identity from a 2020 census survey and a national survey of elderly citizens. It also has sought to bar transgender people from serving in the military and has legally challenged civil rights protections for the group embedded in the nation’s health care law. And although there is commentary in the piece that “Transgender people are frightened,” they are also fighting back with the hashtag, #WontBeErased. However you may feel about gay people, trans people, or about anything that is not heterosexuality, if we do not stand with the most marginalized among us (especially black trans people, who die and are violated at astronomical rates), best believe it gets no better for the rest of us.